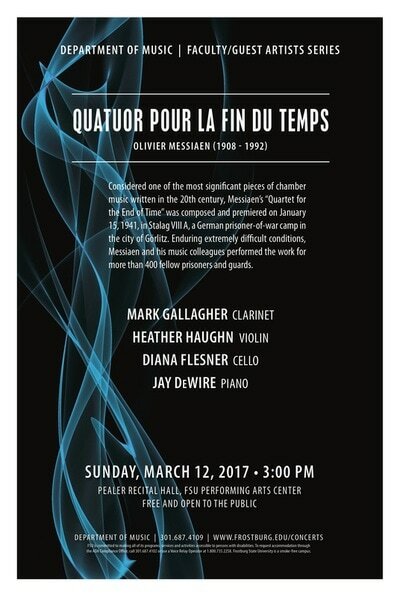 Mark Gallagher maintains a very active recital and chamber music schedule throughout the year. 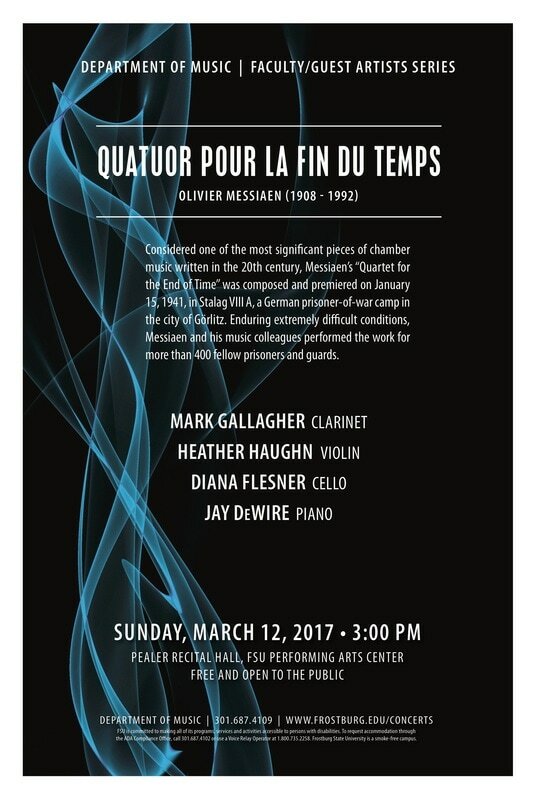 Performing extensively in both the United States, Europe, and Asia, Dr. Gallagher's repertoire spans the spectrum from the Baroque period to the 21st Century. Recent concert tours include Germany, Spain, the Netherlands with a live broadcast on Dutch Public Radio from the Hall of Mirrors at the Concertgebouw, Iceland, Sweden, Norway, Denmark, China, and most recently Ireland. In the summer of 2011, he did a teaching and research tour of France including Lyon and the cane region of Cogolin. Future concert tours include Sweden and Finland. Dr. Gallagher's "Renaissance-Baroque Reconstruction Project" is a project of ongoing research and performance of many mainstream and obscure 16th, 17th, and 18th century instrumental and vocal works. 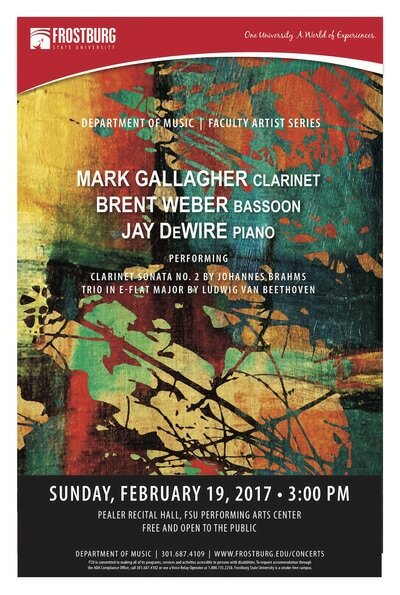 A firm believer that the clarinet would have been used extensively by composers if it had been a more developed instrument. 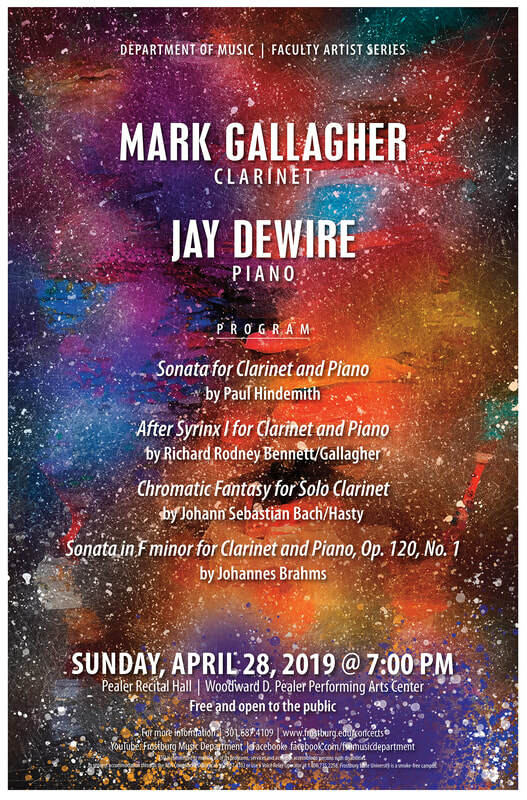 He has reconstructed several works by Byrd, Dowland, de Victoria, Bach, Handel, Telemann, and Hassa for performance on solo recitals, chamber music concerts, and concerto appearances. 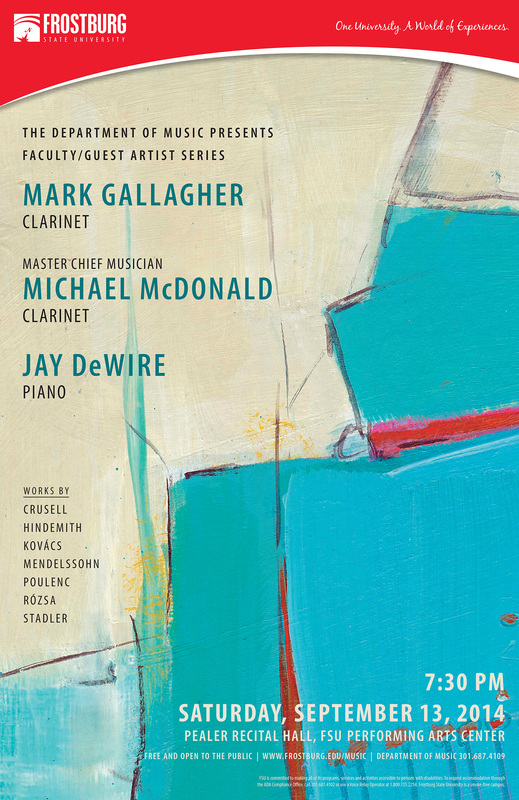 Given the clarinet's extensive range, timbre, agility, and flexibility, several of these works include castrato arias that are rarely performed today. 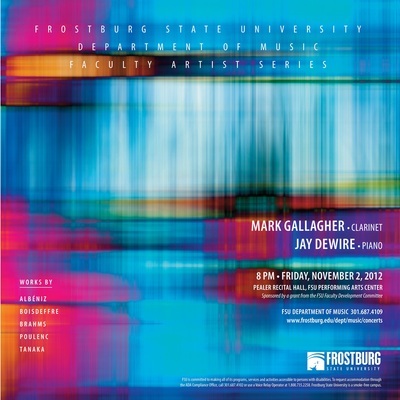 Pealer Recital Hall, 7:00 p.m.
April 28, 2019 Faculty Artist Series, Frostburg State University, Pealer Recital Hall, 7:00 p.m.
November 4, 2018 Faculty/Guest Artist Series, Frostburg State University, Pealer Recital Hall, 3:00 p.m.
December 3, 2017 Faculty/Guest Artist Series, Frostburg State University, Pealer Recital Hall, 3:00 p.m.
October 30, 2017 South Carolina Governor's School for the Arts, Greenville, South Carolina, 7:30 p.m.
July 25, 2017 Frostburg State University - Summer Music Academy Artist Performance, Pealer Recital, 7:00 p.m.
March 12, 2017 Faculty/Guest Artist Series at Frostburg State University, Frostburg, Maryland, 3:00 p.m.
Olivier Messiaen's dramatic and powerful work - "Quartet for the End of Time"
February 19, 2017 Faculty Artist Series at Frostburg State University, Frostburg, Maryland, 3:00 p.m.
Fall 2016 Sabbatical in Freiburg, Germany - Performances, Masterclasses, and Alexander Technique work. April 10, 2016 Faculty/Guest Artist Series at Frostburg State University, Frostburg, Maryland, 3:00 p.m.
November 14, 2015 Faculty Artist Series at Frostburg State University, Frostburg, Maryland, 7:30 p.m.
"An Evening with Robert Schumann"
May 13, 2015 Faculty Artist Series at Frostburg State University, Frostburg, Maryland, 7:30 p.m.
Pealer Recital Hall, 7:30 p.m.
Roland Park Presbyterian Church, 7:30 p.m.
As artistic director and a founding member of I Venti Semplice, Dr. Gallagher has created a group dedicated to the promotion and performance of wind chamber music. 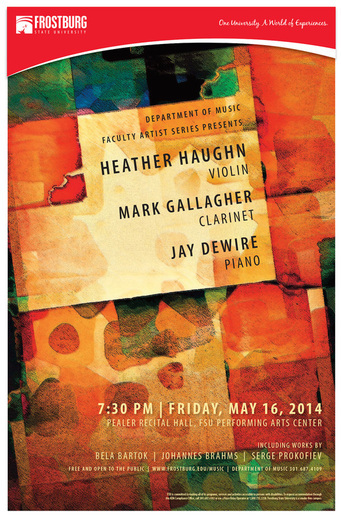 This flexible ensemble performs music ranging from solo to large ensemble works. Performances consist of standard works from the literature, new music, as well as several transcriptions. Based in Washington, DC, I Venti Semplice's concert venues encompass concert halls to historic churches throughout the Mid-Atlantic region and New England. In 2002 the group completed a highly acclaimed tour of New England and in 2004 completed a tour of Maryland, Pennsylvania, Ohio, and Indiana. Recent projects include a series of wind trios by the 18th century Bohemian composers Wenth, Triebensee, and Wranitzky. All of these wind trios have been arranged to accommodate any combination of instruments including the following; flute, oboe, English horn, clarinet, basset horn, and bassoon. 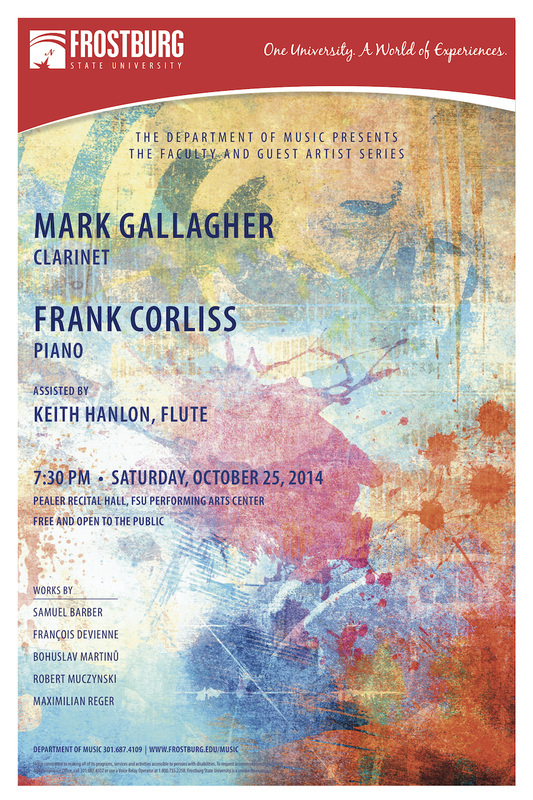 The ensemble is presently involved in a recording project to bring these delightful pieces to the public. 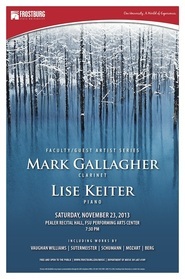 For more information on these pieces, contact Dr. Gallagher at Mark.Gallagher.2008@gmail.com. Ann Townsell is dear friend and an amazing graphic designer. In 2012 the USM Broad of Regents honored her for here excellence and service - an honor well deserved! Below is an excerpt from the article honoring Ann. Ann Townsell, Director of Publications for Frostburg State University, has received the 2012 University System of Maryland Board of Regents Staff Award, the highest honor bestowed on USM staff employees. 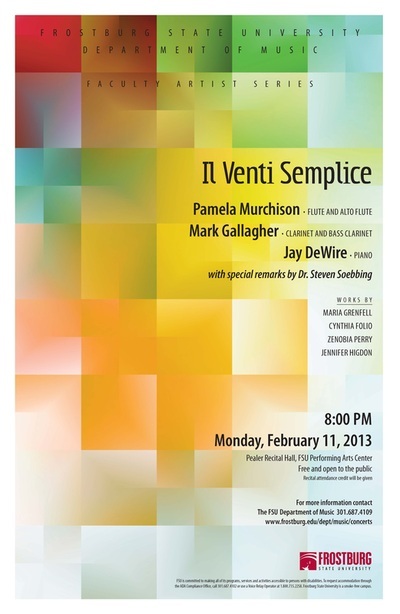 She is being honored for extraordinary public service to the university or greater community. An FSU employee since 1996, Ann designs the graduate publications, homecoming publicity, Foundation publications, Cultural Events Series brochures, theatre brochures, and commencement programs, as well as provides a steady supply of salon-quality photographs of University people and places that further enhance FSU’s publications and websites. In addition, she designed the University’s new logo based on concepts developed through the marketing and branding task force. An active member of FSU’s Learning Green, Living Green Executive Committee, Townsell has undertaken numerous projects and initiatives to promote sustainability on campus. She has also supervised and coached dozens of graphic design student interns, providing them with real-world experience. An official photographer for FSU’s Appalachian Festival, she has donated countless hours of her offtime to provide documentation of the event.